Mice are acclimated to housing conditions for at least a week. a. Mice receiving vehicle or isoniazid are randomized using ProvantisTM 8 to ensure equal mean body weights in each treatment group. b. Immediately prior to fasting, cage bedding is changed to eliminate ingestion of feed crumbs or coprophagy. c. To deplete glutathione reserves within the liver (Harrill et al., 2009), mice are fasted for 18h on Day 1.
d. Baseline body weight is recorded before the first isoniazid or vehicle (sterile, distilled water) treatment is administered, and ad libitum feeding is resumed. e. The same time in the mornings (0900 ± 1.5h) of Days 2, 3, and 4 (t=0h, t=24h, t=48h) mice are treated with either isoniazid or vehicle to avoid any diurnal effects (Fig. 1). f. On Day 2 (t=0h) mice are gavaged with isoniazid at a dose of 100 mg/kg body weight or with vehicle at a volume of 10 mL/kg (Fig. 1). Mice are dosed on Days 3 and 4 under similar conditions. g. Following a change in cage bedding, mice are fasted again for 18h before necropsy to reduce hepatic glycogen, thereby facilitating histopathological assessment of liver injury. Mice are sacrificed 24h after the final dose on Day 5 (t=72h following initial dosing) of the study. Gavaging is used to dose mice with a specified volume (10 mL/kg) of isoniazid or vehicle directly into the stomach. Only specialized, commercially available gavage needles for mice are used. The syringe is first filled with the appropriate volume and material before the needle is attached. a. A mouse is gently restrained by the scruff. b. The tip or ball of the gavaging needle is placed into the mouse's mouth and then gently slid past the back of the tongue. Note: The tip of the needle should slide easily down the esophagus, otherwise, the needle is improperly placed and should never be forced. Any resistance encountered requires the removal of the needle and followed by reinsertion. c. Further injury to surrounding tissues is carefully avoided by holding the syringe and preventing it from aspirating. d. Only when the needle is properly placed, a given dose of vehicle or isoniazid is administered via the attachment of the syringe. a. On Day 5, fasted mice are weighed to determine anesthetic dose (pentobarbital sodium 150 mg/kg body weight) prior to necropsy. b. Terminal blood is collected via the vena cava while under general anesthesia. c. Following exanguination, spleen and liver are harvested and weighed. d. Sample sections of the median and left lobes are fixed in 10% buffered formalin for histology. 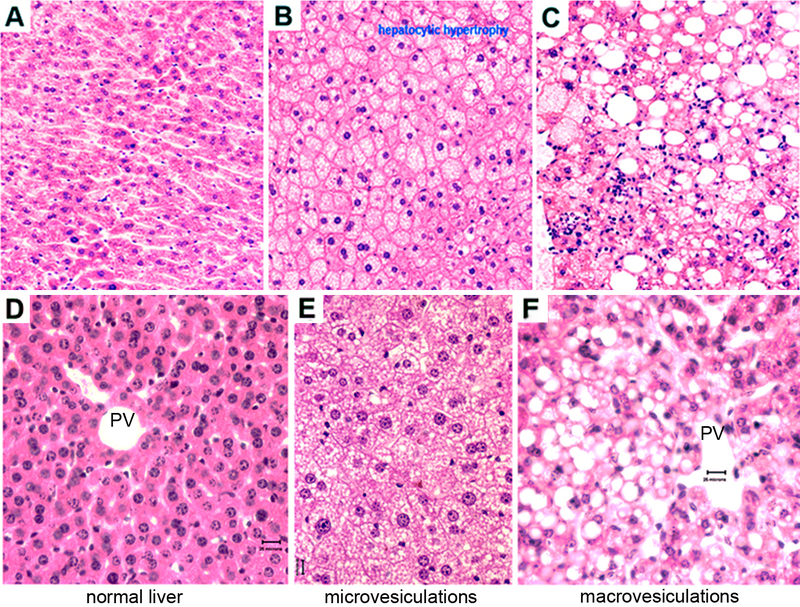 e. Sample sections of the left liver lobes (Fig. 2) are flash frozen in liquid nitrogen, stored in safe-locked tubes, and then sored at -80°C freezer until anaylsis. a. Blood samples are allowed to clot at room temperature for at least 1h. b. Serum is separated from blood cells using serum separation tubes and a table top centrifuge at a speed of 13,000 x g for 20 min. c. The serum layer is pipetted carefully without disturbing the packed blood cell layer below and then transferred into a new pre-labeled tube and stored at -80°C until ready to be assayed. d. The frozen serum is sealed in plastic bags and packaged in wet ice for transport to Antech Diagnostics GLP (Morrisville, NC), which performed the clinical chemistry analyses. e. Serum is assessed for ALT enzyme level. a. Hepatic triglycerides are quantified using the Triglyceride Quantification Kit according to the manufacturer’s recommendations. b. Briefly, 100 mg liver tissue is homogenized with 1 mL 5% Triton-X100 in water, and then slowly heated to 80-100°C in a water bath for 2-5 min, or until the Triton X-100 becomes cloudy, at which time it is slowly cooled down to room temperature. c. The heating process is repeated one more time to solublize all triglyceride into solution. d. The liver homogenate samples are centrifuged for 5 min to remove any insoluble materials. e. The pelleted precipitates are discarded and the supernatant is diluted 10 fold with dH2O. f. Enough Triglyceride Reaction Mixture, consisting of 46 µL Triglyceride Assay Buffer, 2 µL Triglyceride Probe, and 2 µL of Triglyceride Enzyme Mix, or a total of 50 µL reagent mix for each well in a 96-well plate is prepared and applied. g. 50 µL of diluted sample (or diluted standard) is added to each well for a final volume of 100 µL and mixed well. h. Light-protected 96-well microplates are incubated at room temperature for 1h. i. Colorimetric reading for O.D. is done at 570 nm using a microtiter plate reader. Reaction mixture is stable for at least 2h. j. Hepatic triglyceride concentration is plotted using a standard curve method. k. Liver is frozen in liquid nitrogen until processed for hepatic determination of cholesterol. Tissue is homogeneized, lipids extracted through a Folch procedure and hepatic cholesterol is determined using cholesterol oxidase (Sigma) while free cholesterol is determined by high pressure liquid chromatography (HPLC) as previously described (Lammert et al. 1999; Wang et al. 1999). Cholesterol esters are calculated by substraction of free cholesterol from total cholesterol. a. After 24-48h of 10% neutral buffered formalin (NBF)-fixation, the median lobe is further trimmed and placed in tissue cassettes and returned to 10% NBF. b. After an additional 24-48h of fixation, formalin-fixed tissue cassettes are transferred into 70% EtOH solution. c. For each mouse a paraffin-embedded block is prepared from the tissue cassette. d. Embedded liver tissues are cut to a thickness of 5 µm sections and applied to a glass slide in duplicate. e. The sections are then stained with H&E. f. Each slide or histopathology sample is scored blindly for liver injury (Fig. 3). g. A veterinary pathologist independently verified the liver histopathology scores. Figure 2. 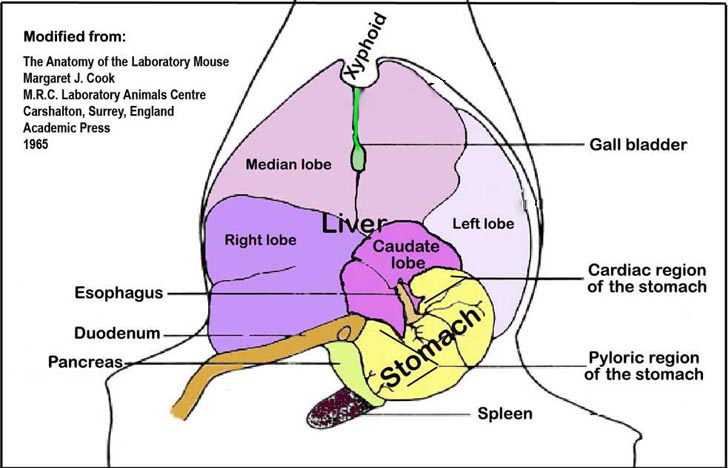 An illustration of the liver lobes and the spleen and their orientation within the abdominal cavity viewed ventro-dorsally. Tissue preparation: determine sample mass/volume by homogenizing 100 mg liver sample in 1 mL of 5% Triton-X100 in water and diluting the homogenate 10-fold with distiled water. The resulting sample concentration would then be 0.01 g/mL (mass of tissue/sample volume).